The Mepro Tru-Dot® RDS is an energy-efficient, compact sight, that provides thousands of operating hours while utilizing a single "AA" battery. Featuring battle-proven LED technology and rugged design, the sight assures reliability under the harshest environmental conditions. With its large display window and clearly-defined Red-dot, the Mepro Tru-Dot® RDS ensures rapid target acquisition with both eyes open. Offering four easily switchable reticle brightness intensities, the Mepro Tru-Dot® RDS fits every tactical scenario. Made in Israel The Mepro M21 is a dual powered 30mm Reflex Sight, which collects sunlight in the day and uses tritium at night. Designed through close collaboration with Israeli Special Forces, the M21 was the first reflex sight in the world designed for close quarter combat, and has been continually improved, making it one of the most advanced sights available today. Bullpup Armory gets the most current production pieces, so these sights have the latest improvements (M revision). The HD7 has been designed to be a strong, reliable optic that offers the most in operator selectable features that exceed the market standards, at a price that is friendly to the wallet. The MIL-SPEC, Mepro RDS PRO is exclusively available in the United States. Outside of the U.S., the RDS PRO is known as the Mepro M5 which is standard-issue to the most elite fighting forces and law enforcement agencies worldwide. The Mepro RDS PRO is a MIL-SPEC, energy-efficient, compact sight that provides thousands of operating hours while utilizing a single “AA” lithium battery. With battle-proven LED technology and a rugged MIL-SPEC design it performs under the harshest environmental conditions. With its large display window and clearly defined red dot, the Mepro RDS PRO ensures rapid target acquisition with both eyes open. Offering four easily switchable reticle brightness intensities, the Mepro Tru-Dot® RDS series optics fit every tactical scenario. Made in Israel The MEPRO MX3 provides a decisive solution for any operator in the field. Its 3x magnification enhances the precision and effectiveness of reflex sights such as the MEPRO 21 and the MEPRO MOR. Attaches to any Mil-Std 1913 rail and has a quick detach lever. Made in Israel. The MEPRO MX3 provides a decisive solution for any operator in the field. Its 3x magnification enhances the precision and effectiveness of reflex sights such as the MEPRO 21 and the MEPRO MOR. Replacement rail for the Tavor. This is the "Full Length" version, which is a 35-slot rail that is the same length as the flat-top models, but adds some height for a more comfortable cheek weld. Another advantage is that the rail does not need to be removed to do a barrel change (no re-zeroing!). Replacement rail for the Steyr AUG. This is a 23-slot rail that is the same as the factory rail, but weighs only 5.5 ounces. Three QD sling swivel ports (one in the front, factory location, and one on each side at the rear of the rail, far enough behind the charging handle to not get in the way!) The Razorback line of rails incorporates the GHW USA Mounting System for additional accessories and mounting positions in a compact platform. Note: This does not fit the new A3 M1. Only the regular A3. Finally IDF owners have a way to use thier own magnifier on their IDF-model Tavor. The Gear Head Works IDF Magnifier Rail has a 7-slot standard Mil Spec 1913 rail and a quick rotating mount all machined as one piece. It can be used with magnifiers, night vision, or thermal and allows the entire unit to be quickly removed from the rifle. No need for expensive QD rings. Use a standard fixed ring or mount and let this rail be the way you attach it in the field. A taller rail for the IDF model Tavor, for a more comfortable cheek-weld. The IDF 101 Rail from Gear Head Works replaces the factory installed Mepro, attaching directly to the gas block (similar to the factory installed Mepro). And it still allows for a co-witness with the factory flip-up sights. The Gear Head Works Razorback Front Sight matches up to most AR15 rear sights when used on your short Tavor Razorback. Inspired by the factory IDF front sight, it operates the same way, folding up and down just like the factory IDF front sight. An aluminum replacement forearm with modular capabilities for the Tavor by Gear Head Works, called the Tavor Modular Forearm, or simply the TMF. Light mounting is included! Attach 1" light or laser in-line with the barrel, slots for ventilation and accepts Magpul M-Lok accessories. Rifle, light, grip, pressure pad, and pad kit shown in pictures, not included. Made in the USA! The M7 Micro Dot, red dot sight delivers a bright and precise, fast target acquisition with all of the durability that LUCID has come to be known for. The M7 Micro Dot has the ability to sense the light conditions and adjust the reticle brightness accordingly. The LUCID M7 Riser Mount is designed for mounting the LUCID M7 red dot sight onto a flattop style rifle or shotgun as the primary optic. 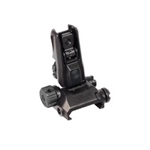 When used in conjunction with back up iron sights this mount provides a lower third co-witnessed. The LUCID screw-in 2x magnifier is an option available for the LUCID HD7 red dot sight and the NEW M7 Micro red dot sight. This magnifier was specifically designed to answer the demand for those who want a dedicated magnified view for their 1x red dot optic. With a built in ocular focus adjustment and a very forgiving eye relief this magnifier will bring the targets close enough to gain the added precision you may be looking for on your set-up. Also, those operators that may have a tiny bit of uncorrected astigmatism should know that a little magnification will help correct the appearance of a blurry reticle. The MBUS® Pro is a corrosion resistant all-steel back-up sighting solution that delivers maximum functionality and strength with minimum bulk at a price that's even smaller than its size. The dual aperture (windage adjustable Rear and no-tool, elevation adjustable Front) excel in all 1913 Picatinny rail mounting applications, including rail-height gas blocks. Made in U.S.A. The MBUS® Pro is a corrosion resistant all-steel back-up sighting solution that delivers maximum functionality and strength with minimum bulk at a price that's even smaller than its size. The dual aperture (windage adjustable Rear and no-tool, elevation adjustable Front) excel in all 1913 Picatinny rail mounting applications, including rail-height gas blocks. KNS Precision's MBUS-PRO Post Sight Assortment For Magpul's MBUS-PRO steel rifle sights. All post sight bodies are steel, with black oxide finish. Made in the USA! The W.O.R. helps with the "wash-out" experienced when aiming the Mepro21 into a well lit area, from a dark area. The light collector on the Mepro21 has dimmed the reticle from the lack of light in the immediate area, although a brighter reticle is needed when pointed from the "dark" area into a "bright" area. The W.O.R. solves the issue! By installing the W.O.R. on the Mepro21, you can turn it on when a brighter reticle is needed. Available in the original "On/Off" model, or a "Rheostat" (adjustable brightness) model. Dual Variable Scope Rings is a one-piece mount for picatinny rails. Fits scopes with 30mm scope diameter (or 1" with included inserts). Center height measures 1.58” (from top of rail to center of scope). Lightweight aluminum mount (5 oz) can be installed/removed in seconds with thumbnut. CAA - 5 Position Laser and Light Mount 1"
Quickly move your light or laser from one side of the weapon to the other. • Locks in position at 0° 45° 90° 135° 180° Quick release, offset/side, composite rail mount for most 1-inch lights. Quick release, in-line, composite rail mount for most 1-inch lights. LUCID is proud to offer the world's first variable magnifier for red dot sights. Now the operator is able to transition quickly between a CQB operation to a designated marksman capability in an instant with the same Bullpup! LUCID's 2x-5x Variable Magnifier mounts behind any red dot sight (with the right mount). This high quality optic offers clear optical performance, and maintains an expansive field of view with a comfortable eye relief through the entire magnification range. NOTE: The 2x-5x Variable Magnifier from LUCID has been updated to offer an ocular focus ability! The Burris QD Pivot Ring is ideal for mounting a magnifying optic behind a primary optic. Extremely easy use with Quick Detach rail attachment, and push-button engagement of the pivoting arm. The Burris Tactical AR-QD Pivot Ring is designed specifically for carbines firing the .223 Rem or 5.56 Nato cartridges, and works with any 30mm magnifier.